A vintage take on beach wedding invites, these separate and send wedding invitations feature sketched starfish with an ornate, Baroque-style flourish. The result is stunning! Design and wording are printed in your choice of colors and fonts. Separate and send wedding invitations come with two detachable enclosure cards (response card and reception card) on one convenient sheet. 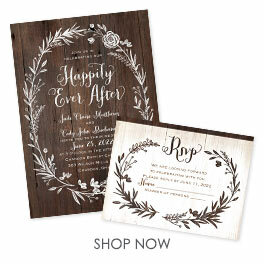 They also come with invitation envelopes and response card envelopes for a complete, coordinated stationery set. Special Note: separate and send enclosures are perforated for detaching from invitation. These beach wedding invitations feature thermography printing, an affordable printing process that results in raised lettering. Excellent quality for a great price! I have been trying to help my daughter in law with the expenses of her wedding, and I came across this site because I am also on a tight budget! These were delivered promptly, and look beautiful. The perforation is slightly visible where they tear apart, but it's hardly noticeable and I trimmed it off with a small paper trimmer I have for scrapbooking and they look great. Also, I called customer service with a question and I was surprised how quickly she answered and was able to help me with no issues. Would definitely recommend this company for your bridal purchases!